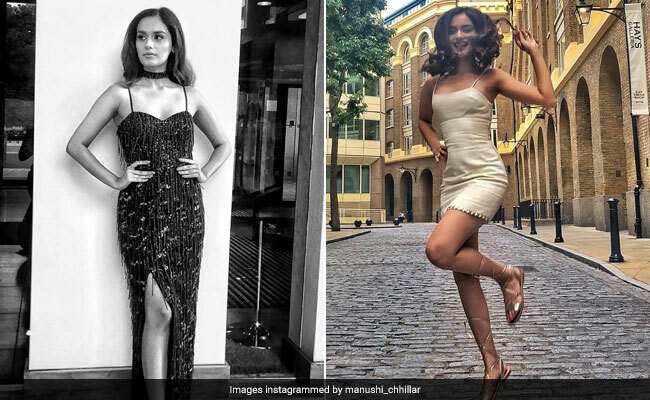 Miss World 2017 Manushi Chhillar seems to have had a year so far that rings true to her title. The 21-year-old beauty pageant winner has constantly been on the go since she won the crown in November last year. Philippines, New Zealand, United Kingdom, South Africa – these are just a few of the countries Manushi has visited in the last two months alone. While we can’t be certain which part of the world Manushi is in currently, we are sure about one thing – Manushi is leaving no stones unturned to look her stylish best while on her tour of the world. There’s no doubt that the contestants of a pageant such as Miss World have a grueling routine to keep themselves in the very best shape they can be in. The evidence lies in Manushi’s well defined physique and her perfectly toned legs – both of which we’re getting to see plenty of these days thanks to Manushi’s sartorial choices. Manushi recently shared a picture of herself in a Zara Umrigar beaded and fringe black maxi dress. Her dress featured a thigh-high slit on one side. Not too much, but just enough – don’t you think? Prior to this, Manushi shared a picture of herself in Birmingham, United Kingdom, in a mini dress from designer Anita Dongre. How can we not take note of this mini slip dress worn by Manushi in London? She looks absolutely resplendent even though she’s wearing an all white outfit. Did we hear about a heatwave in the UK? Because we really think Manushi could have something to do with it. Do you not think she’s absolutely setting the temperature soaring in this hot pants and t-shirt combination? We definitely do. #LegsForDays is all we can say about this picture of Manushi in a Papa Don’t Preach by Shubhika, dress. While Manushi seems to be having a great time traveling the world (and looking uber stylish while doing so), it’s hasn’t just been all play for her. Manushi has visited a number of countries as a part of her “Beauty With A Purpose” tour. She has been working hard to debunk stereotypes and myths and spread awareness around issues like leprosy, menstrual hygiene, women empowerment, the importance of education and so on. More power to you, Manushi!